Female Vocalist of the Year for the 2015 Midwest Music Awards Lauren Anderson will be performing Live at Lefty's on February 16th, Saturday at 7pm. Lauren Anderson- Originally from Chicago, Lauren has had a passion for singing that has been undeniable ever she was a little girl. Even as a preschooler, she often interruptedher class, promptly making up a song about whatever activity the class was about to participate in. Lauren grew up listening to artists like Susan Tedeschi, Bonnie Raitt, The Pointer Sisters, Eva Cassidy, Etta James, Joss Stone, Jason Mraz, Black Eyed Peas, Christina Aguilera, Adele, and many more. Despite her main musical influences, Lauren was classically trained throughout most of her life. She began classical piano lessons at the age of 8, was a member of several choirs and began taking classical voice lessons when she began high school. She eventually took her love of singing to the Quad Cities and obtained a bachelors degree in music with an emphasis on voice at Augustana College. Initially she planned on becoming an opera singer, but quickly realized that pop and soul was a better fit for her. Having had a passion for psychology in addition to music, Lauren decided to continue onto The University of Kansas to complete her masters in music therapy. She now works on the pediatric unit and pediatric intensive care unit at The University of Kansas Hospital in KCMO, as well as at Gillis Center as a music therapist. After officially completing her masters in 2012, Lauren began performing solo gigs around the greater Kansas City area at venues such as Bar Louie, Jerry's Bait Shop and Main Street Cafe. 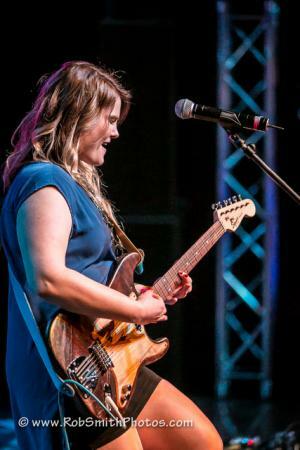 She quickly realized that she could only go so far in the business while playing solo gigs, so she began attending jam sessions at venues such as Freddy T's, Llewelyn's Pub and Westport Saloon. It was at such jams that she met Kristopher Schnebelen (previously from Trampled Under Foot), Dylan Reiter (from Brandon Miller Band) and Adam Stuber, who now make up her band, The Lauren Anderson Project. Their first official EP, Do & Hope, was released in August 2014, which can be purchased at shows and on the home page of their website, www.LaurenAndersonMusic.com.